One of my favorites though the years is a live Easter basket. It takes about a week for the grass to grow, but it is a great project to do with kids or grandkids. 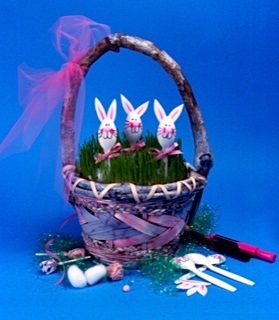 A live Easter basket with Spoon Bunnies is a great project to do with the kids or grandkids. Line the inside of your basket with plastic and leave at least 6” of excess all the way around. Fill the basket to within an inch of the top with potting soil and pat the soil down firmly. Sprinkle the surface generously with seed, and cover lightly (1/4” to ½”) with potting soil. Water well, making sure all the seeds are moistened. Pull the excess plastic over the top of the soil to preserve moisture. Set the basket in a warm, sunny spot. In two to three days, the seeds will start to sprout, and within a week to ten days, you will have grass. Decorate the basket with a bow and colored eggs. Add a Spoon Bunny to the basket. The grass will grow rapidly. Trim with scissors. Use the trimmed grass in sandwiches or salads. Tuck these delightful bunnies into your live Easter basket. Paint eyes, mouth, and cheeks on the back of each spoon. Let dry. Tie three 1-1/2” strands of heavy black thread together in the middle and glue above the mouth for whiskers. Glue pink pompom nose above the whiskers. Cut ears out of the white felt, and cut smaller inside ears out of pink felt. Glue small pink ears on larger white ears, and glue to back of head. Place a sucker in the spoon and tie ribbon around the neck. Glue a small white pompom or cotton ball tail on the sucker stick. Dian’s Book Tipping the Scales in Your Favor shares her weight loss journey. For years Dian’s tried and tried to lose weight, but it was not until Jackie Keller said to her in California, “I can help you lose weight,” that she caught the vision and lost more than 115 pounds and, most important, she has been able to keep it off. Get Dian’s book today and begin the journey to healthy living. Go to www.DianThomas.com to learn more. What to travel with Dian? Join one of her trips to China, where you will enjoy a cultural feast and fun adventure. Email Dian at Contact@DianThomas.com or call 801-277-4332 for more information.